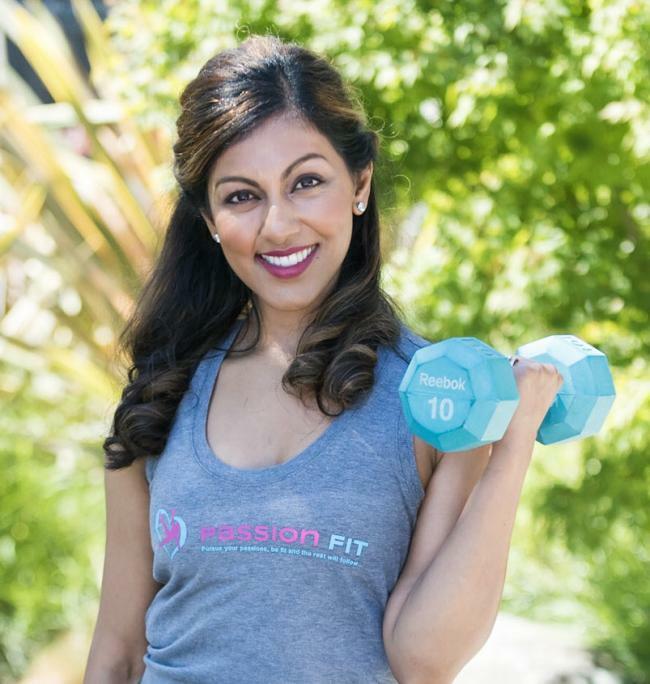 My name is Reena Vokoun and I’m the founder of Passion Fit. I’m a proud mom of two boys and am happily married to my husband. I’m the youngest of four siblings and a first generation born Indian-American who grew up in the Midwest, has lived on the East and West Coasts and is a Californian at heart. My lifelong passion for health, wellness and fitness and desire to help others is what led me to make a bold move and leave Corporate America and my amazing job at Google to become an entrepreneur and start this company. I have 18 years of experience working in the digital media industry in sales, marketing and business development roles for Google, Reebok, Grokker, Yahoo, GE and CNET. I have a BBA in Marketing and Management from the University of Wisconsin-Madison and an MS in Advertising and Communications from Boston University. I have 10+ years of experience as a fitness/dance instructor, am a former high school cheerleader and co-captain of my high school dance team and taught fitness classes on campus throughout college. In addition, I was a U.S. silver medalist in the ESPN Fitness Championships and have completed a marathon, half marathon and several 10k and 5k races. I’m currently an entrepreneur, alumni board member of the University of Wisconsin-Madison School of Business, member of the Mountain View Chamber of Commerce and member of the Watermark Women’s Leadership organization in the San Francisco Bay Area. I’m also a digital content creator, marketer, blogger, public speaker, Athleta and Reebok Fit Pro and certified health and fitness professional. I’m a member of IDEA Fitness and certified through the American Council on Exercise (ACE), the Athletics and Fitness Association of America (AFAA) and the American Heart Association (AHA). My Indian-American upbringing, the fact that I’m a mom and wife and my academic and professional corporate background, are major influencers in my unique approach to Passion Fit. My experiences during my academic and professional careers and witnessing others’ experiences during those years showed me how much overwork, stress, a lack of work-life balance and a lack of taking care of your wellbeing can impact your health and life and therefore, I’m passionate about educating others and helping them take control of their lives in these areas. My philosophies on health, wellness and fitness are holistic, combine the best of the East and West and incorporate considerations for your family. My digital content, classes, events and business partnerships are consistently met with a strong work ethic, positive results, high integrity, creativity, strategic thinking, authenticity, passion and professionalism. $20.00 / hr, In addition to the drop-in rate, class packages are available and discounts and promotions are also offered on a regular basis.